How Often Should You Change Your Vehicle’s Fuel Filter? You may not realize how important it is to change your fuel filter, but it is never too late to learn. To help preserve the life of your car, educate yourself on the inner workings of your vehicle, including the importance of the fuel system filter. Your vehicle’s fuel system, most obviously, has a vital job in the grand scheme. It stores and supplies the gasoline, or diesel fuel, that your vehicle needs to run. The fuel pump acts as the heart in your body: it will pump fuel through the fuel lines. The fuel filter will grab anything that could be potentially harmful to your vehicle. The key segments of the fuel system are the fuel pump, fuel gauge, fuel tank, fuel filter, fuel lines, and fuel injectors. Focusing on the fuel filter: this component of the fuel system is required to maintain a clean flow of fuel through to your engine. 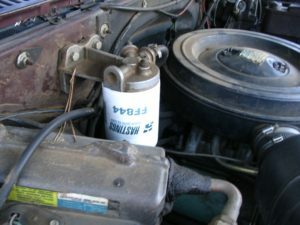 Some vehicles have two fuel filters: one filter being inside the fuel tank, and the other in-line between the fuel tank and the engine. Some vehicles have just one fuel filter, which has an integration with the fuel pump module assembly. Fuel filters serve a vital function for your engine. Unfiltered fuel can contain several harmful materials: rust, dirt, and other debris. Your fuel filter will remove these materials because, if it cannot, they can cause damage to high-precision components. When fewer contaminants are present in the fuel that your vehicle uses, the more efficiently you will use it – the more efficiently your vehicle will run. If a fuel filter becomes clogged, the fuel pump must work hard to get pump past the clog. This issue can lead to damage in the electric fuel pump. Now that you understand the importance of the fuel system filter, you may wonder how often to change fuel filter. If your transportation has a replaceable in-line fuel filter, it is an excellent idea to replace it every 30,000 miles. A few good indications that you need to change your fuel filter are wear and rust. The other systems will include the hard starts, idling, hesitation, fuel leaks, the smell of fuel, and poor overall vehicle performance. If you notice these signs and are not sure, seek a professional’s advice. A properly running fuel filter system will make sure that your vehicle runs efficiently on the fuel that it needs. All toxins are for removal, and only vital energy is added into your vehicle’s engine. If you have gone unchecked, your fuel filter may cease to work well. Debris and other potentially harmful materials will get into your fuel and your engine and dramatically affect the performance – and lifetime – of your vehicle. The importance of regular vehicle maintenance is to help increase its life. BMW Fuel Pressure Regulator: How to Know If It Needs Repair?